Gina K is having the 1st ever customer blog hop!! We were to use one of the newest releases or the Holiday Cheer kit. I chose the Stamp TV Holiday Cheer kit. I just Love the snowflakes in this set!! I used Rocket Red CS, ribbon and a button from the Stamp TV kit. 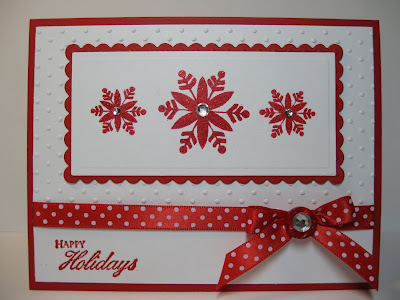 Thanks for stopping by and be sure to head over to Gina's blog and check out all the other beautiful cards and projects! wow! love the red n white with the CB and nestie...pops!!! Red and white- looks terrific and festive. Beautiful card, Janice! I love the clean style and the bright red and white combo! Oh Janice, I love everything about this! The snowflakes, the cb texture, the colors....everything! oh gorgeous! love this color combo and the embossed background! Simply gorgeous! I love how clean this is. Love love love the red and white! Ohhh this is just gorgeous!! Those red snowflakes just POP! Wow! This is gorgeous, Janice! I love it! Those snowflakes with the rhinestones are beautiful! Gorgeous card!! Love the red and white!! It really does pop! Gorgeous, love the red and white together. I love red and white together. Great card, Janice. What a striking color combo....love the snowflakes with the bling in the centers and your ribbon treatment is sooo pretty!!! Gorgeous Janice! Love the simplicity! I came to comment on your jugs card and then I saw this! How did I miss it? It jumped off the page... I had to comment! It is way over the top gorgeous!I love red and white cards they just pop! Love your crisp & clean creation, Janice! Beautiful card. I love the clean and simple style with the red and white. Congrats on winning! Yay...another free stamp set! Congrats Janice. Congratulations on winning Gina's blog hop with this card, Janice. I love the CAS look. Janice - this card is so pretty! Red is my fav color and it looks great paired with just the white! Love it! Congrats on winning the blog hop! Love your card - it is simply beautiful! Thanks for sharing & happy Thanksgiving!